Easy to add/update and delete categories into the Magento store using CSV file. 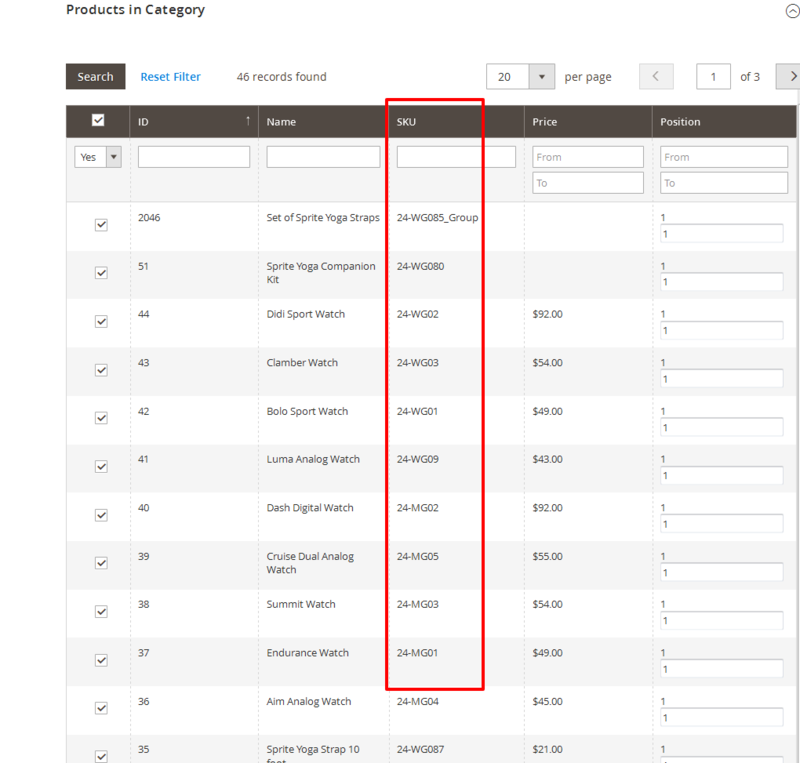 Assign products into categories while importing categories via CSV file. This extension will import/export root categories, sub categories and also assign Products. You can import/export any type of category related data like meta descriptions, meta title, meta keywords as well as if the category active, anchor, category description, category image, page layout and custom layout. This extension facilitates creation of multiple categories, at-a-time using CSV files. You can easily add/update and delete categories using only single CSV file. 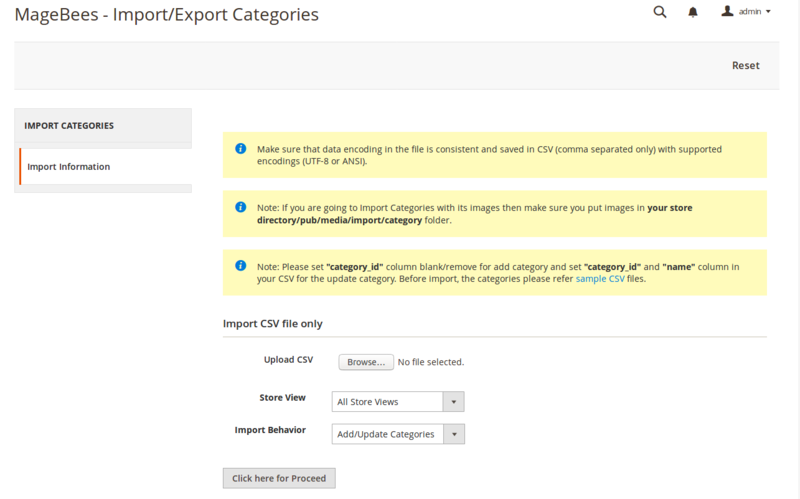 2) Go to Your Site Backend -> SYSTEM -> MageBees – Import/Export Categories -> Import Categories. Note: If you are going to Import categories with its images then make sure you put images in your store directory/pub/media/import/category folder. 3) Please upload your created csv file and click on “Click here for Proceed” button. 4) Now successfully import categories.Your store categories will be display on admin -> PRODUCTS -> Products -> Inventory -> Categories. 1) Go to Your Site Backend -> SYSTEM -> MageBees – Import/Export Categories -> Export Categories. 2) Select any attributes set then click on “Export Categories” Button. Great import export extension module for M2. We have purchased other extensions from the same company and would recommend without any hesitation. + any problems, customer support is first class! Simple to install, simple to utilize and does what I anticipate that it will do.Incredible extension! There are such a significant number of developers out there and it's dependably an intense choice on which one to pick when numerous offer a similar sort of extension, with quick reply and support, from my experience I would stick to Magebees. Nice Functionality and easy to use. This extension provided us the ability to import specific data that is not available through the standard Magento CE import tool. We had some issues with the data transfer, however, it was do to my user error and was corrected in a timely manner by MageBees support. I would highly recommend this extension for anyone with a large number of categories. Extension and Support both are excellent and quick. Would recommend without any hesitation and will certainly use again. Makes your job easy and save time. Good guides and documentation. Provide option for delete categories. Q-1 :I have installed import export categories extension but got following error. “There has been an error processing your request”. “ Please upgrade your database: Run bin/magento setup:upgrade ”.